Kelly spent years oblivious to how much fun, adventure and freedom mountain biking would bring to her life. And then one day, a friend broke his foot and asked Kelly if she would like to borrow his bike, all his (way to big) kit and join the ride. She was immediately hooked. 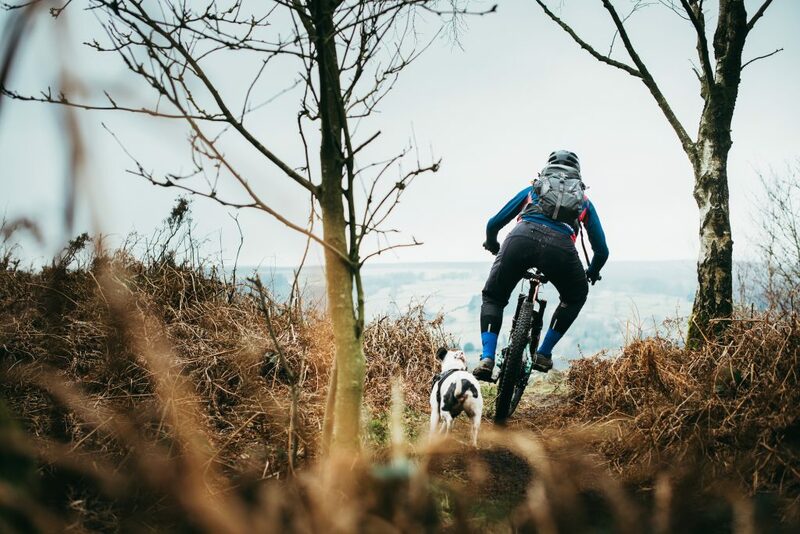 Kelly tells us how she went from borrowing an old hardtail to now owning her own fleet of bikes, how she plans her rides using komoot and that it is possible to make your dog an awesome riding buddy. I’ve been into mountain biking for four years now. I started out learning the basics by visiting my local trail centers, before bursting properly into the outdoors and exploring more natural trails. Living in Derbyshire, I’m spoilt with fast access into the Peak District where there is an abundance of exploration to be done. 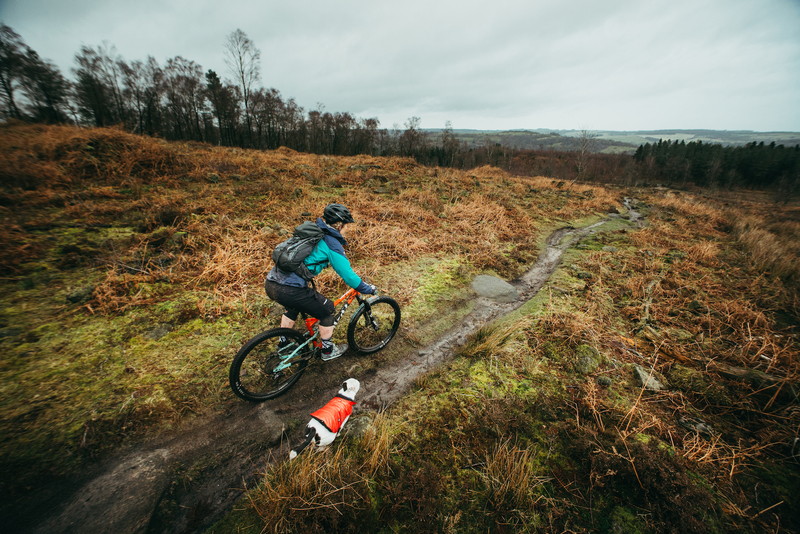 There is everything from technical singletrack, to wide but wild trails across the moorland, all topped off with stunning views. The night before a ride, I’m the type of person who likes to get organized! I get all my kit ready, sit down with my laptop and plan my route on komoot. I tend to link up bridleways with cool spots that locals have built in the woods. If there are any Highlights on route, I always add them in. When I first started out, I was short on riding buddies especially fellow mountain bike girls. But I found a facebook page for ‘mountain bike chicks’, which I joined and quickly linked up with other riders. As soon as I had dipped into the scene, I realized what a huge community of cyclists there is in Sheffield and the surrounding area. In fact, my local cafe called Cafe Adventure in the village Hope is such an awesome bike hub. They run mixed and women only rides, and they serve up a great coffee and slab of cake. At the moment, my job gives me a lot of flexibility. I work with kids who have had adoption or care home breakdowns. I take them away on weekend adventures, allowing them to have some time out in nature: We go camping, hang out and enjoy outdoor pursuits. This means I often get the chance to hit the trails mid-week, albeit alone, so my dog Belle comes along for company. She’s a cool riding buddy. I’ve had her since she was a pup and trained her to become a bike dog at the local pump track. This has been a success and she knows never to go in front of the bike and definitely benefits from all the exercise! My boyfriend and I own a van that we are totally in love with. It gives us so much freedom and has been a gateway into riding in Europe for us. Last year we jumped on the ferry with no plans but 3 bikes each, an enduro, a road and a jump bike. We would head to a spot and if we liked it hang out for a few days, then head to the next recommendation. We have plans to spend 3 weeks doing the same this year. I can’t tell you exactly where we will go but I’m sure it will involve Italy, Switzerland and Austria. Local adventures are always a blast and recently I have got my hands on a packraft. I’m super excited about it and am taking my bike and raft to Skye on a bothy trip. We want to be very remote, so from the planning, it looks like it may involve some hiking as well as biking, including to tap into the less explored trails. 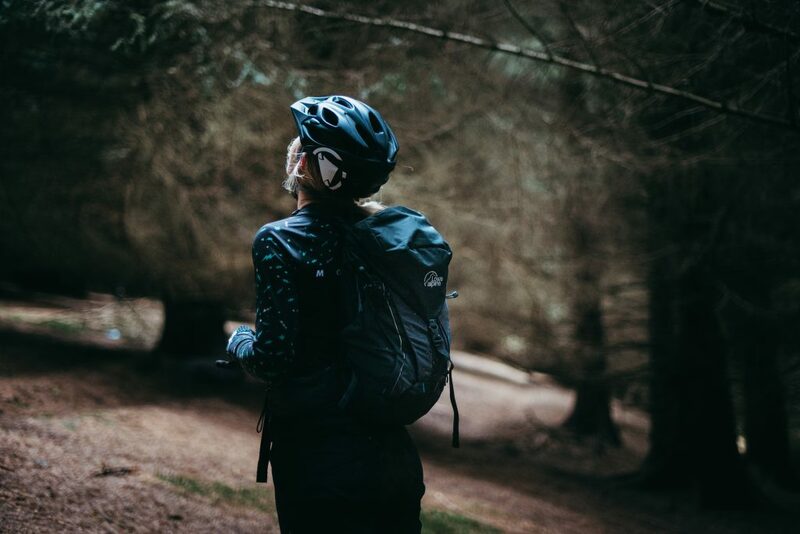 When I’m riding from my doorstep my top local spot to ride is the Hemlock trail, which is just outside Nottingham. They host big dig days, so its a cool way to be involved in the local community and meet other riders. It’s such a great secret spot as the woodland is tiny and tucked away outside of town, and it’s home to three amazing mountain bike trails.! Sundays are dig days and the turn out is always great. Even when it was snowing in the winter 20 plus people would turn up to work on the trails. When I’m off the bike getting some rest, I’m consistently planning routes or writing about my rides. That’s why I love komoot: I’m really into sharing the places I discover. I want other people to benefit from being outdoors, doing sports and getting out to the secret spots that bring me so much happiness. My no.1 user hack for komoot is if you’re in a new area plot your route around Highlights. After all, they have all been recommended for a reason and are always worth checking out.